If you’ve spent more than 5 minutes on Modern Reject, then you know of my great admiration and fondness for a certain Frank Viola. 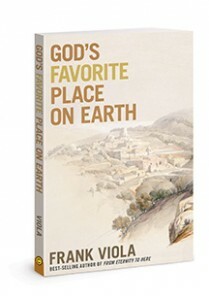 Well, my friend Frank has just released a new book called God’s Favorite Place on Earth that could literally change your relationship with God, help you defeat bitterness, free you from a guilty conscience, and help you overcome fear, doubt and discouragement once and for all. Sound too good to be true? Like some Christian version of a late night infomercial…? This is a book that will jar you out of your “Christian rut” and give you new eyes for looking at EVERYTHING. It’s a quick, inspiring, and entertaining read. I promise. In fact, God’s Favorite Place on Earth already spoke into my own life in a very specific and profound way. All that to say, you should buy this book. Buy it now. And me saying that means something because this is the first book I have ever heavily endorsed on this blog. Here’s the sweetest part: if you get the book between May 1st to May 7th, you will also get 25 FREE GIFTS from 15 different authors including Leonard Sweet, Jeff Goins, Andrew Farley, Steve McVey, DeVern Fromke, Pete Briscoe, Frank Viola himself, and many others. Ahh-maazing, right? Over 47 Christian leaders have recommended the book, including me. I am inviting you to visit GodsFavoritePlace.com to get hooked up with your 25 FREE GIFTS, read a Sampler of the book, and watch a compelling video trailer. You’ll be happy you did. P.S. I wasn’t paid or perked in any way for this endorsement. I just genuinely love the book (and Frank Viola) and wanted to share it with you. Just for kicks, what’s the best book you’ve read lately? Alright, alright, this is the SECOND strongly worded recommendation I’ve read in as many minutes. Off to the Kindle store I go! I’m so bad about reading books lately. I have Joyce Meyer’s book that I’m reading again, Battlefield of the Mind. I was just going to ask if the book was on Kindle but looks like someone answered the question. Something new. The Ten Percenters. Because our Father has always reserved and taken the first ten percent for Himself, yes? His Holiness is not isolation; it is blessing. And He is the One drawing that line in the sands of the lifetimes of men and women this side of Heaven. The invitation is out. The call has been made. His sheep know His voice. It’s time to cease playing at petty religion, and to start being who He has called us to be. No more pithy theological debates. No more futile struggling and long-winded dialogues that keep us rooted in being victims, offering us no solutions, but heaping upon our spirits further doubt. I know you understand what I am saying. I believe you understand what our Father is announcing. Let’s do this, Nicole. Let’s be a part of this. Let us throw down false imaginations and tear down strongholds. The World has its version of The Church. We are not members or adherents thereof. Let us be The Ten Percenters.